December 7, 2017 – London, UK and New York, NY – Adapt Ready is delighted to announce that we have once again been honored with an industry award. Beating a field which included AIR Worldwide, CAPS Consortium and ISO, Adapt Ready won the “Excellence in Technology – Service Provider” award at the Insurance Times Awards 2017 in London. Presenting the award, Insurance Times said that it was Adapt Ready’s Aria platform that had “won judges over, because it is a new concept with a lot of potential, which could identify exposures that otherwise would have not been possible to detect”. The Insurance Times Awards is attended by over 1,000 top names in the insurance industry and seeks to recognize those companies that have made a considerable contribution to the sector throughout the year. 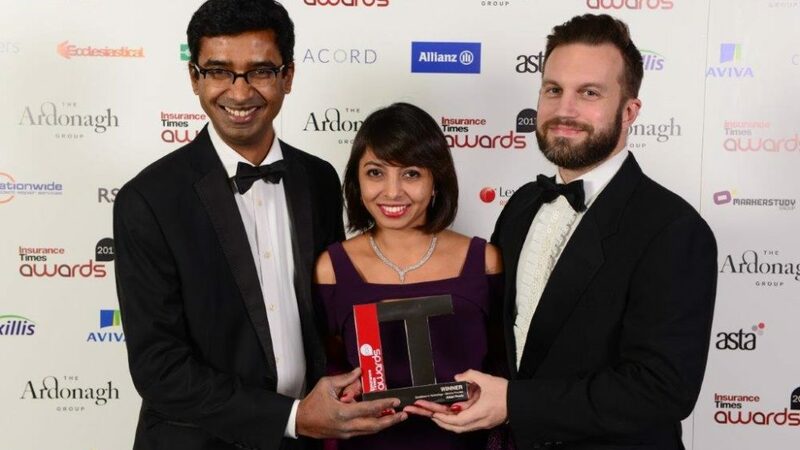 “Winning a second award in a short period of time, and at a prestigious event such as this one, has been icing on the cake for a very fruitful year for us,” said Adapt Ready’s CEO, Shruthi Rao. “Many thanks to the team at Adapt Ready and to our mentors, advisors and customers for helping make that possible”. The Insurance Times Awards are a celebration of achievements of the UK insurance industry, attended annually by over 1,000 guests.